I did not quite catch the royal wedding bug, especially the whole build-up to the big day, though I did watch the ceremony live on one of my computer screens while pretending to do some work on another. May the Duke and Duchess of Sussex have a long and happy marriage. Given that they are unlikely to become king and queen and assume constitutional roles, because unspeakable tragedy would have to befall the Duke of Cambridge and his children for such to happen, it is going to be interesting to see what roles the newly-weds create for themselves. In that regard, where they would be prominent public figures, perhaps the Duchess of Sussex is uniquely suited for the role because of her background and career. The monarchy in Britain contributes enormously to the economy, or so it is said, and a joyous occasion such as this is a commercial opportunity for many retailers. Shops have been selling wedding-related items and the local Oxfam charity shop was no exception. 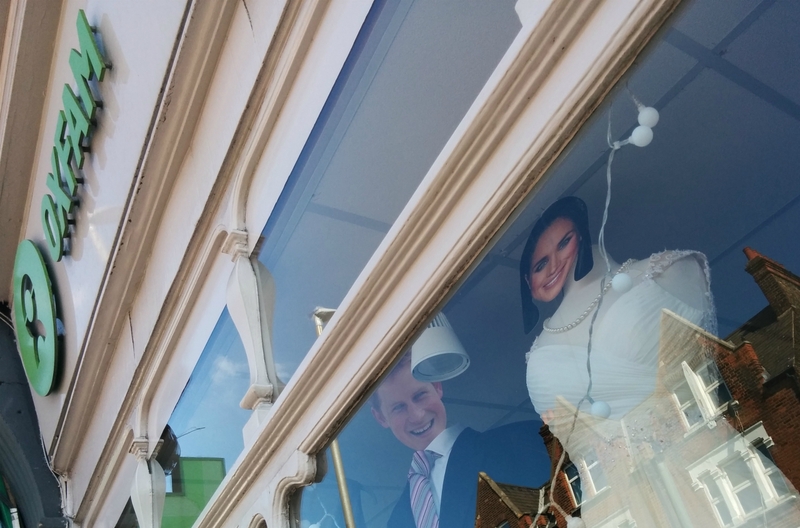 The masks worn by the mannequins were somewhat bizarre, with the grinning and clean-shaven Duke of Sussex looking down on you, and to my eyes the Duchess of Sussex not really resembling her likeness.